Everything Rachael Ray: Want a New Old Fridge? Rachael Ray gets lots of comments about the appliances on her various sets. They have a metro-retro feel and certainly don't look like anything they sell in stores around my house. The Northwest Herald tracked down how you and I can get "a restored vintage range or for a new range with modern guts and an authentically retro facade." The owner of the Elmira Stove Works says that their product's appearance on the Rachael Ray show has provided exposure that they otherwise might not have gotten: "Some people just don’t know these are available," Dowling said. Well, now you and I know! did she change her fridge? 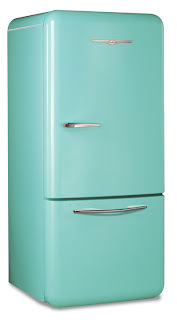 cz lately i've seen a frigidare retro one instead of this Elmira one.. email me please ! The stove is a Chambers range, and we service, repair, sell, install, refurbish, and restore them, as well as ALL other vintage appliances. We service ALL brands of stoves and refrigerators. If you need service or want to buy a vintage stove give us call. We have great references and we're licensed, insured, bonded, and certified. Our phone number is: (909) 595-7864. Ask for Brian. He’s a great tech, a very nice guy, and can do whatever you need. He will help you in any way he can.